Stop The Mass Poultry Farms! Today (1 Dec. 2014) there was bad news again: another big poultry farm near my place had to kill all it’s feathered live stock. Earlier this week I wrote a song about this subject. Yesterday I was triggered by a news item that the farmers can get compensation for the bird flu damage from a fund with a bizarre name: they called it the “Animal Health Fund”. 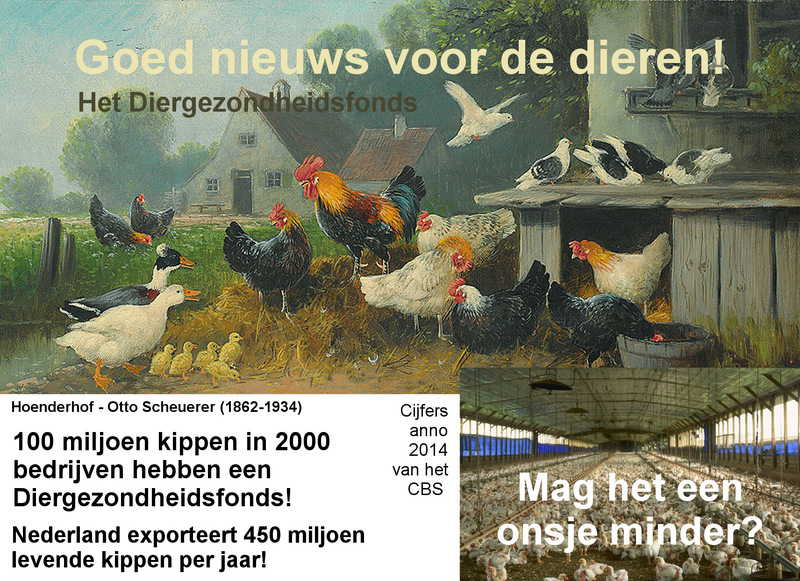 I did some more research on modern chicken breeding and wrote an article in Dutch. The poultry industry has gone completely out of hand. Just a few fully automated large scale companies are busy ruining Europe’s smaller farms, exporting 450 million living chicken all over Europe. In Holland the number of poultry farms has reduced to nearly half the number of farms in 2000. The number of chickens has gone up with 20%. Approx. 100 biological farms have a stable 2% of the market during the last three years. Protest song against the modern poultry farming industry. Only two days old, we were excited we could fly! Cat food they made of my fiftythousand brothers! Children will love chickens that lay eggs behind the house!